A few years ago Adrienne Nixon Basco was hanging out at a music festival with her former band, the Charlotte Southern rock outfit Swamp da Wamp, when a guy approached her with a curious but sincere look on his face. "He got really quiet and said, 'Let me ask you a question: Is it awkward for you to be performing this kind of music?'" Nixon Basco chuckles at her memory of the guy's naïveté. He was nice enough, she insists; he didn't mean any harm. "My answer to him was, 'Why would it be awkward for me? It's mine.'" The exchange is not uncommon for Nixon Basco, who's currently the frontwoman of a newer Charlotte band, Tombstone Betty. She says she's always answering variations on the same question. After all, she's a powerful black female lead singer in a musical genre — traditional, old-school Southern rock — that remains one of the last bastions of whiteness in rock 'n' roll, even though that makes absolutely no sense, given the music's rich mix of blues, soul, gospel, country and power riffs. But the guy's question underscores preconceptions that we all, to a certain degree, bring to music events, in terms of cultural identity and cultural expectations. We wear our preferences for certain types of folk, rock, country or hip-hop like badges representing race, nationality, gender identity, political affiliation, religious belief and other specific worldviews. Too often, we draw lines in the sand — either consciously or subconsciously — rather than letting music just be something that pulls us all together. Nixon Basco explained to the guy what she meant by, "It's mine." "I said, 'This music is the product of the Little Richards and the Chuck Berrys and the Fats Dominos. It's as much my music as it is anybody else's.'" She's sitting at a corner table in the back room of Amelie's French Bakery in NoDa on a drizzly Wednesday afternoon, wearing a white top, faded black jeans and black cowboy boots. Sporting a silver necklace, leather bracelet and gold nose ring — and carrying a giant red vegan tote bag imprinted with a Mexican sugar skull — the slender, 42-year-old singer with the stunning mane of jet-black hair is rock 'n' roll incarnate. But she's no Ronnie Van Zant. 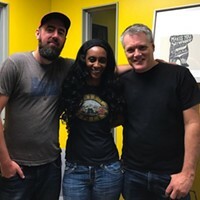 In a perfect world, Nixon Basco's very being as the frontwoman of a Southern rock band in Charlotte, North Carolina, in 2018, would not be an issue. But we don't live in a perfect world — we live in today's world, in which some of the more well-known veterans of '70s-era Southern rock, such as Charlie Daniels, and younger Johnny-come-latelys like non-Southerner Kid Rock, have jumped on the Trump train, riding defiant cultural insensitivity from small county fairs to nightclubs to large tribal gatherings in sheds and arenas all across the United States. The music, the festivals and the uniforms have become sadly (though not completely accurately) synonymous with reactionary politics. In 2012, far-right fans of Lynyrd Skynyrd, the late Van Zant's much-mythologized band of Florida-born rabble-rousers, were outraged when sole remaining founding member Gary Rossington suggested in a CNN interview that Skynyrd might back away from displaying the Confederate flag onstage. He quickly backpedalled in a history-challenged note posted to placate fans on the band's Facebook page. "We know what the Dixie flag represents and its heritage; the Civil War was fought over States [sic] rights," Rossington wrote. "We still utilize the Confederate (Rebel) flag on stage every night in our shows. . ."
Nixon Basco's experiences with the Confederate flag stand, quite naturally, in stark contrast to those of Lynyrd Skynyrd's angry fans. On one occasion, she found herself on an outdoor stage next to a giant rebel flag; the performance wound up in a YouTube video. "It was a private party. The man who threw it is this old biker, and kind of a mystery to me," Nixon Basco says. "For whatever reasons, he loves us to death and he's always been nothing but nice to me. But yeah, he also has that flag just about everywhere. There was no escaping it anywhere when I was on that stage, and I was like..." — she shakes her head — 'Wow! Really?' That was uncomfortable." Former CL music editor Kandia Crazy Horse, author of Rip It Up: The Black Experience in Rock N Roll, understands Nixon Basco's dilemma. 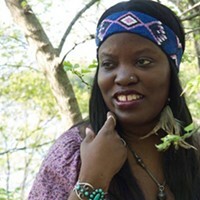 Crazy Horse is an expert on Southern rock who's been in the trenches for decades, writing about it, lecturing about it, speaking in documentaries about it and performing her own blend of African-American country and soul on her 2013 album Stampede. "As a fanatic of Southern rock," Crazy Horse says, "the Confederate battle flag does not give me pause nor prevent me from going where I want to go. The music is mine, a space where the blues and country meet and are refashioned into other sounds. 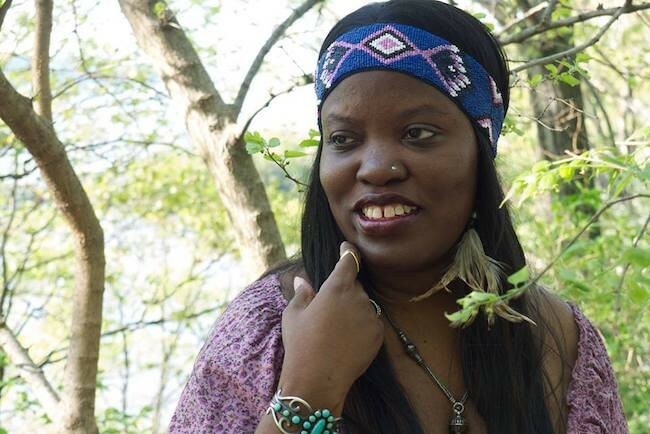 "Both races love and were reared on this music," she continues, "such that by now there should be no assumption that only our white brethren follow Southern rock." "More power to this sister for prevailing out there on the road," Crazy Horse says. 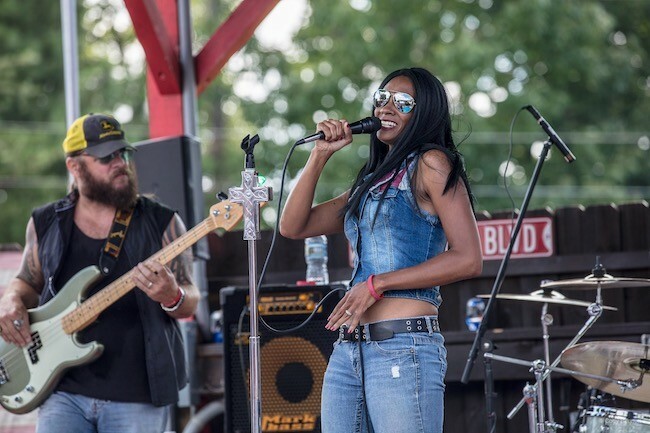 On Friday, June 8, Nixon Basco and her Tombstone Betty bandmates will hit the stage at the Hog Happenin' Bikes and BBQ fest up in Newton, to play songs from their new self-titled debut EP. While it would be an egregious stereotype to suggest everybody in the crowd will be questioning her role at the festival or waving Confederate flags, some will. And Nixon Basco aims to change their perceptions. "It bothers me that Southern white people think they own Southern rock," Nixon Basco says. "It's not theirs. It doesn't belong exclusively to them. 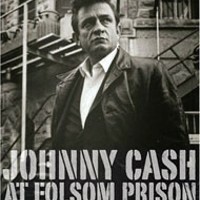 It's got a blues background, it's got gospel thrown in, it's got country." During Southern rock's mid-'70s heyday, British music fans seemed to intuitively understand and appreciate the nuances in the music's rich gumbo of Southern American styles, perhaps even more than some Americans did. Skynyrd was huge in the U.K., and the Brits had long produced their own Southern American-style bands, from the raw, pre-Skynyrd blues-rock of the Yardbirds to the soulful rock of the Small Faces, who sometimes performed with black American R&B singer P.P. Arnold, to early-'70s acts like Humble Pie and Free. Arnold once said she relocated to the U.K. because, "A young black woman on her own in America in a white environment would not have been treated as well as I was in England." Says Nixon Basco, "The British are the ones who really got it. They're the ones who really picked up on what Southern rock actually is — which is this wonderful amalgam of all of these different types of music." "Southern rock is simply saying rock rock," Crazy Horse says, "for the music springs from this region and it does so in the image of its greatest practitioners, like [the late Allman Brothers Band guitarist] Duane Allman, who bridged the gap between black and white." If some of today's Southern rock fans here, where the music was born, don't fully grasp these distinctions in 2018, Nixon Basco is here to remind them. "They'll understand by the end of our shows. They'll hear all those influences in our music," she says. "And I'll speak about it. I mean, I don't want to make our performances a course in music history, but I absolutely plan to address the fact that there are many different influences in this music — and in Tombstone Betty's music particularly." The band's new EP runs the gamut of old-school Southern rock and boogie, from the thick, Humble Pie-like riffs and slide guitars of "Try My Wine" to the Harley engine-charged hard rock of "Rev It Up" to the gentle, country-ish "Let it Roll," an acoustic-based ballad worthy of a cigarette-lighter-waving encore. She wrote the latter song one rainy night while driving her black Cadillac across a bridge over Lake Norman. "I was coming home from work in the rain and saw the water, and it just came to me," Nixon Brasco says. "So here I am — I'm trying to keep the car on the road while singing into my phone 'cause I don't want to forget it." Nixon Basco's voice, a mix of sassy honky-tonk twang and rowdy rock 'n' roll grit, captures the essence of whatever she's singing — in particular, on lines like, "Don't play around on Tombstone Betty / 'Cause if you do, your nightmares are gonna come true." Those femme-empowering lyrics come in the refrain of Tombstone Betty's self-titled theme song, a wild and woolly story-song about a badass woman who will not be fucked with: "She was just a little girl when her daddy left town, and her mama gave a word of advice: / If you ever have a lover who's loving on another, take him out and don't think twice. / . . . That's why any man caught playing 'round on Betty's gonna surely end up dead." The band punctuates the storyline with a husky call-and-response: "And all the folks say, 'Hey' ('HEY!')." "We also have a new song which is not on the EP, called 'Everybody,' that's a little more punk-influenced," Nixon Basco says. "And we've got other songs that we haven't completely fleshed out that are more country-oriented. That kind of mix is very deliberate. Growing up in the South, you can't help but have all of those things coming at you at the same time, influencing what you do." 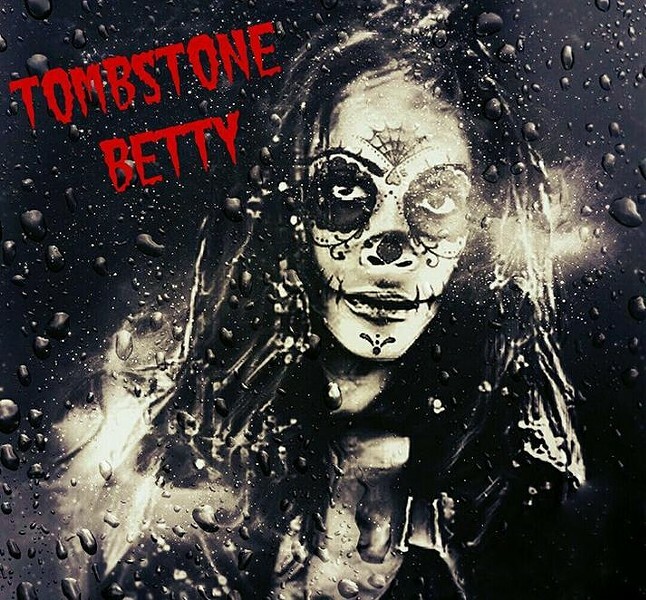 Listen to Tombstone Betty's theme song from the new EP. 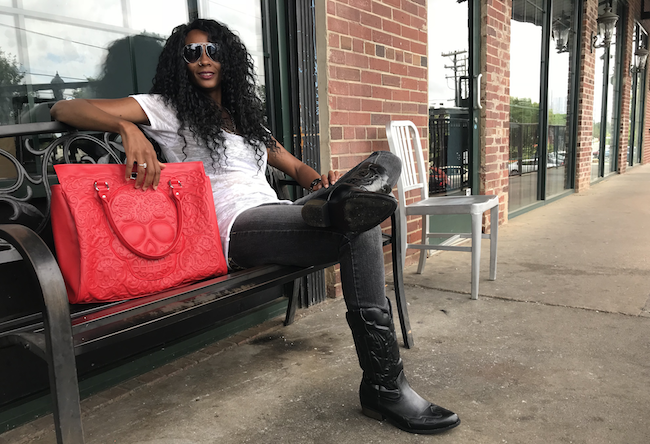 Born in Mooresville when it was still a small town, Adrienne Nixon always felt different from her friends and family members. "One of my mom's favorite words to describe me was 'weird.' I'm her weird child," she says with a laugh. Nixon Basco's mother sang gospel, and her sister — 16 years Adrienne's senior — introduced her to disco and funk. But her father, who lived in Greensboro and served as band director at North Carolina A&T State University for 30 years, introduced her to classical music. "My father sent me a couple of Mantovani albums early on and I listened to them and totally fell in love with Mozart and then started listening to a lot of Mozart, Holst and all these different composers," Nixon Basco remembers. "I decided that's what I wanted to do." She laughs. "By this point in my life, I was supposed to be scoring movies. I wanted to be a little Danny Elfman or Michael Kamen." By junior high, Adrienne had graduated to metal because, she says, "Good metal is very technical, like classical music. What really grabbed me was hearing Sepultura's version of Beethoven's Ninth. I lost it. I was in love with metal from that point on, and I started getting into Death Angel and Pantera, and '70s metal like Black Sabbath, and glam metal and the stuff in between, like Guns 'N Roses." Her tastes set her apart in Mooresville. "You just didn't see a lot of people who look like me listening to metal," she says. "Even now, you don't see it." After graduating high school in 1994, she enrolled in Davidson College, initially to study music, but wound up switching to theater. She swore she would never sing in public, she says, "because my mom is such a good singer, I didn't want to be compared to her." But three years later, she landed a role in Hair. "They tricked me into it," she remembers. "They said, 'Everybody has to do a vocal audition.' I said, 'OK, fine.' So I went in there, sang a little bit and everything got quiet. I said, 'What did I do wrong?' They said, 'Absolutely nothing,' then got these big smiles on their faces. Next thing you know I was opening the show singing 'Aquarius.'" Adrienne Nixon hit the ground running after college, landing roles with Children's Theatre of Charlotte. She got to know Charlotte actor April Jones when Jones played her older sister, Manyara, in the African Cinderella story Mufaro's Beautiful Daughter. "That was such a great little family atmosphere that we had at the time with April and Sidney Horton — he was our dad," Nixon Basco remembers, with a laugh. "Ask her about African Tales of Earth and Sky," Jones says when contacted for her recollections of her time working with Nixon Basco. "She was a 'creature' named Mmotia," Jones says. "I think she was green." She laughs, but then gets serious. "I'm not surprised she fronts a band now," Jones says of her former colleague. "Adrienne always was drawn more to the musical theater aspect of performance, so it seems perfect for her." The band stuff came about four years ago, when Rich Basco, who's now Nixon Basco's husband, tracked her down on Facebook. 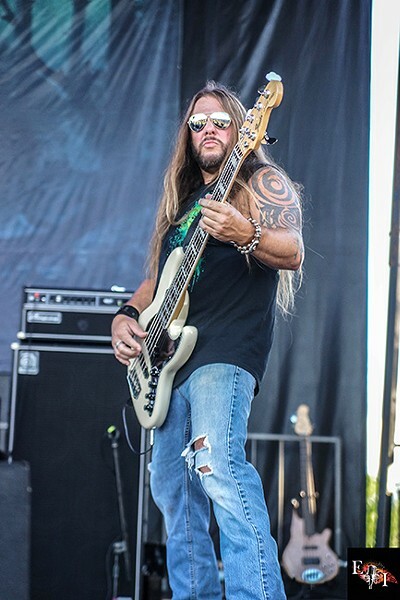 He was the bassist for Swamp da Wamp, a band fronted by the late Gig Michaels, a husky Ronnie Van Zant lookalike who commanded the stage with his brown leather hat and big personality. Swamp da Wamp was looking for a second female backup singer. Nixon Basco was 38 at the time and thought to herself, What the hell? "In my head, that just meant that I'd be one of two women dressed in black in the background throwing in a few ooo's now and then," she says. But when the second backup singer left the band to spend more time with her family, Michaels asked Nixon Basco to join him in the spotlight. "Then he had the bright idea for me to start my own band," she remembers. "I said, 'We'll get around to that later. I'm having a good time just backing you right now.'" In early January 2016, shortly after Swamp da Wamp released its fifth album, Michaels died of pneumonia on the eve of his 52nd birthday. Devastated, the band called it quits. Rich Basco wasn't sure he even wanted to continue doing music. "He was really heartbroken," Nixon Basco remembers. "Gig was one of his best friends and one of my really good friends." But she wasn't ready to pack it in. After all, she'd just started getting some momentum and had begun to write songs of her own. "I decided I was going to do what Gig said I should do, and form my own band," she says. Rich was hesitant. "To a certain extent, he's still very heartbroken over it, so he was kind of reluctant to play at all at first." Tombstone Betty's initial incarnation included other former members of Swamp da Wamp, including guitarist Nick Nguyen, who plays the sizzling slide part on "Try My Wine." But Nguyen lives in Nashville now, and the trip back and forth to Charlotte was too much for him. The group eventually gelled with two members borrowed from the local funk-based hard-rock act English, whose music is in the vein of the '70s Atlanta outfit Mother's Finest, one of the few racially mixed Southern bands of that era. Nixon Basco is happy with Tombstone Betty's latest lineup, but the process, she says, hasn't been easy. "It was difficult to get them to believe in me enough to want to be part of the project," she says of all the members who have floated through the group. "I mean, Southern rock is by nature a very white, very male-dominated genre at this point." That's something Nixon Basco is on a mission to shake up. "I want to be a face for change. We want to change a lot of things," she says with a mischievous smile.